Serving Central Florida for over 30 years. Specializing in copier, printer and fax service, sales and supplies for your business needs. Providing you with quality service and supplies for HP, Brother, Samsung, Sharp, Xerox & more. All of our remanufactured cartridges come with all new plastic cases, rollers, blades and compatible toner. These cartridges come with a 100% satisfaction guarantee and yield as much or more as an OEM/original equipment manufacturer cartridge. We can provide OEM pricing but our remanufactured cartridges have a 97% success rate. Approximatly 2 quarts of oil are needed to manufacture an OEM cartridge, so by using remanufactured cartridges, not only are you able to save some money, you also help the environment. Some of the clients that we provide remanufactured cartridges to are The Volusia County School Board, City of DeLand, Halifax Hospital as well as several hundred doctors and small businesses in the area. We supply service from typewriters to computers. Please give us the opportunity to stop by and give you a free analysis of your consumable needs. Please call 386-566-7018 for references and pricing. 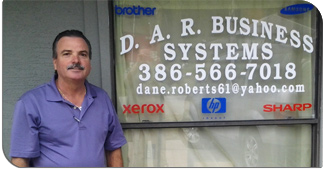 If you live in the Volusia or Seminole area, including Deland, Daytona Beach, Deltona, Sanford and other surrounding areas and are looking for a professional, locally owned and operated member of your community to handle your printer repairs, copier repairs, fax repairs or service needs then D.A.R. Business Solutions is the choice for you.